Rodeo Austin kicks off soon, March 14-28, at the Travis County Expo Center. While many fans enjoy the food, entertainment, rides, and award-winning livestock - the main attraction is undoubtedly the rough stock events - barebacks, bronco, and bull riding. Like football, basketball, or hockey, rodeo riding is a tough sport requiring a great deal of skill and athleticism. Professional rodeo riders, or cowboys, must train like any other athlete. These men and women need strong core muscles as well as superior upper body strength to balance atop a large and aggressive animal, or strategically rope something (such as a calf) moving swiftly alongside them. Strong hips and knee joints are also necessary to help hang on tight! Simple exercises such as arm and shoulder, or hip and leg extensions with a resistance band, as well as squats to strengthen thigh and leg muscles, might be typical of a rider's workout.Stretching to loosen the neck and spine before and after an event is also important. As with all sports, injuries occur even with the most experienced professionals. Fractures, dislocations, sprains/strains, ligament tears, and skin abrasions are common. A more severe injury might be a spinal cord injury or concussion. According to historical data from the NCBI (National Center for Biotechnology Information), head and neck trauma typcially accounts for 10-29% of reported rodeo injuries, with concussion incidence rates of 3.4 per 1000 competitive exposures. 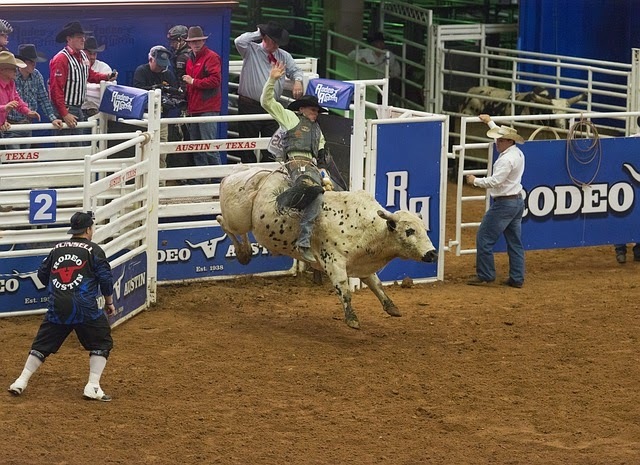 Professional associations for rodeo cowboys now encourage riders to consistently sport proper headgear and other protective equipment (helmets, braces, cervical collars, mouthpieces, and special vests) while urging sufficient recovery time following serious injuries like concussions - such as practiced in the NFL and NHL. Many rodeos these days are equipped with onside medical care for riders needing urgent attention. These custom-made mobile facilities house first-aid supplies, and often x-ray and ultrasound machines to quickly diagnose treatment.